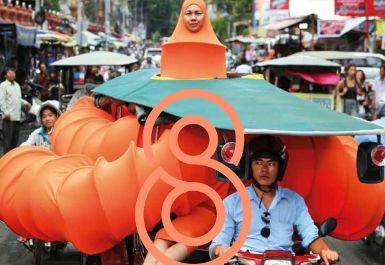 Brook Andrew's project for APT8 represents the intervention of art practice into the conventions of museum display. Several of Andrew's recent major installations and graphic works are inspired by patterns found on dendroglyphs (carved trees) and shields specific to his mother's Wiradjuri nation (in New South Wales). 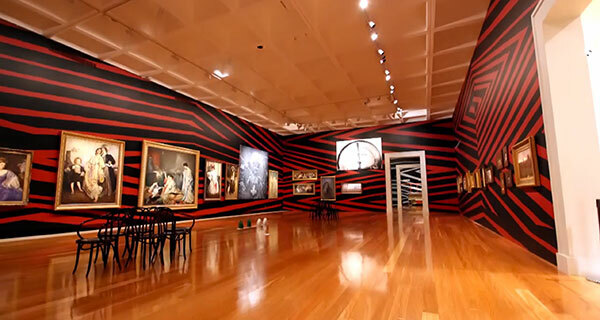 In Intervening Time 2015 Andrew has applied his contemporary hypnotic pattern in black over the existing wall colours of three Australian Collection galleries, and installed among the Collection his six-part 2012 installation Time. 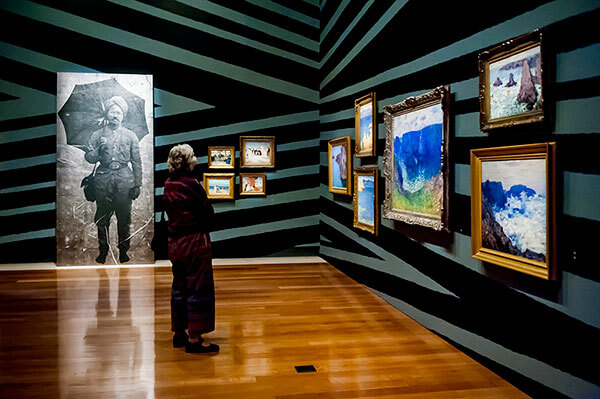 Presented as a ground against which the Collection has been rehung, Andrew's wall design asserts its presence in the historical and contemporary narratives that shape our understanding of Australian landscape, people and culture. 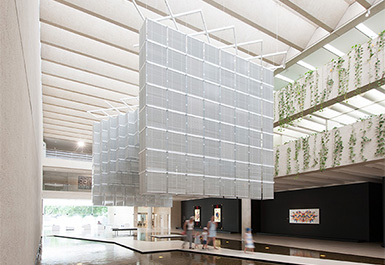 Brook Andrew collaborated with QAGOMA curatorial staff in the realisation of this project. The historical narrative and display he encountered in the three galleries has been changed only slightly, through the inclusion of international works of historical Nepalese and Indian art, in addition to images representing states of conflict by Goya, Warhol and Hirschfeld Mack. 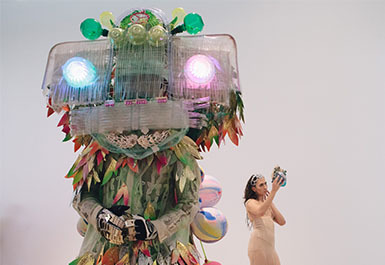 Intervening Time proposes a more layered, complex consideration of the encounters between indigenous and other cultures. The six canvases comprising Time assemble historical imagery from diverse points of origin around the world, a strategy through which Brook Andrew seeks to link Australian histories and experiences to those of other peoples. 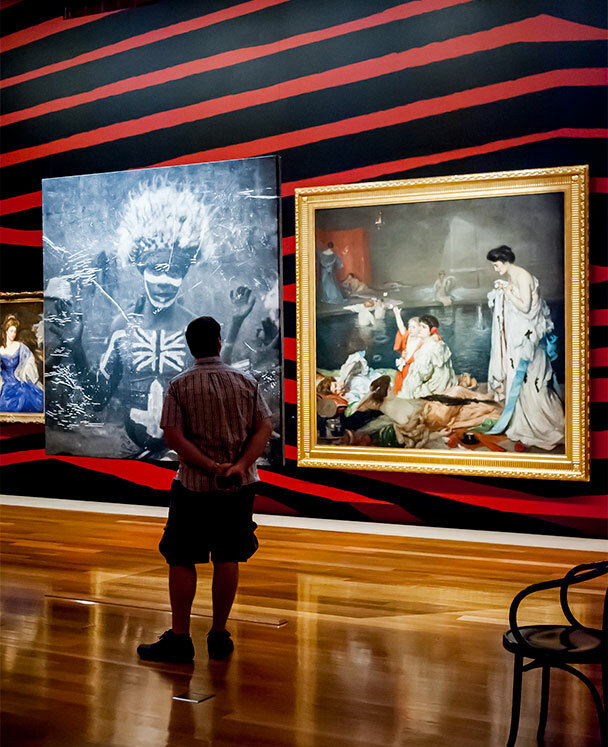 The installation includes one image with a direct Indigenous reference: a detail from an early 20th century group photograph of an Aboriginal man painted-up with a Union Jack – the mark of empire – upon his chest. 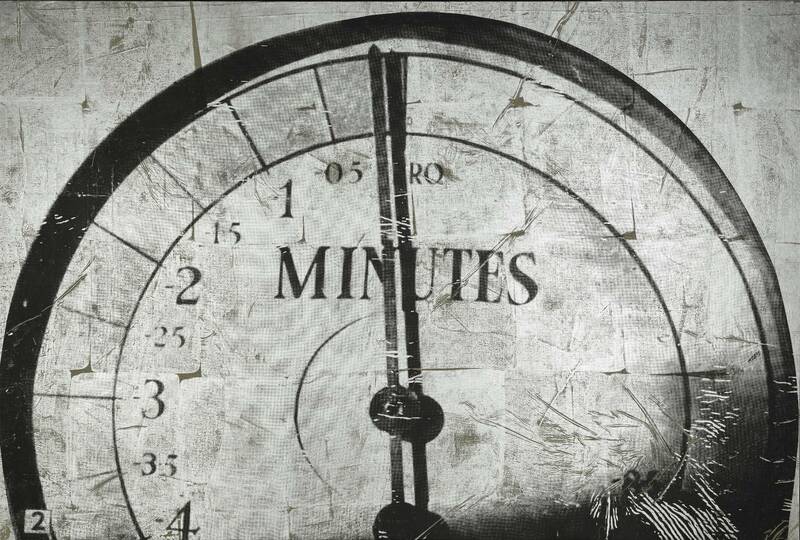 Other images include a British Raj Indian postal worker; people amongst the rubble of a collapsed 1st WW European building; an image of a clock counting backward toward a zero hour (a reference to British atomic bomb tests in the Monte Bello Islands and Maralinga from 1952–63); and the Australian Museum, Sydney. Each work is speculatively connected to the other through signs of time and historical situations. Andrew's juxtaposition of disparate pictures constructs an open-ended narrative that provokes questions around the fragile and volatile political, social and environmental systems that are structuring our contemporary world.